Hi and welcome to my blog, this is very exciting, my first image that I am giving away for free. To download just click on the image and it will open in a new window, then you can right click and save to your computer. I love all thing vintage and enjoy searching the web for royalty free images to use in my art and craft work and now I get to share them with you. Please comment below I would love to hear your thoughts. 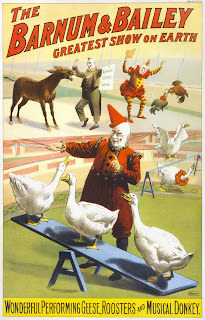 This circus poster was created in 1900 "The Barnum & Bailey greatest show on earth Wonderful performing geese, roosters and musical donkey"
I hope this image inspires you to create something new and wonderful.